Josh and Hilary Dildine?s interactive illustration invites guests to add their fingerprints and signatures. As a new couple puts down roots and begins to grow a life together, give them an unforgettable send-off with this interactive, commemorative art piece. 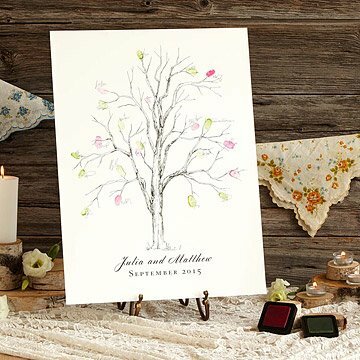 Created by designers (and married couple) Josh and Hilary Dildine as an alternative to the traditional wedding guest registry, each has a line drawing of a towering ash tree along with the name and wedding date of the happy couple, all printed on archival watercolor paper. But the piece isn't done yet, because as the guests arrive, they use the included ink pads to add their own unique fingerprints to the paper, creating what appears to be a cloud of vibrant leaves crowning the tree. The included pen allows each guest to sign their individual contribution, and even leave a small message. The resulting artwork is both a keepsake the couple will treasure for a lifetime, and a symbol of the countless hands that have touched their lives so far. Designed and printed in Los Angeles, California. This size print is designed to accommodate 80-150 guests. For other designs, check out the Prop Plane Guestbook, and the Tandem Bike Guestbook. Husband and wife team Josh and Hilary Dildine collaborated on their first guestbook fingerprint tree for their own wedding. Their collection has grown since then, offering interactive guestbook alternatives that are beautiful illustrations of human connection. "I strive for elegant, timeless designs that will be stunning every day for a lifetime," says Hilary. They created these designs exclusively for UncommonGoods from their home studio in Los Angeles. Arrives rolled in mailer tube with 2 ink pads and a pen. This was great fun at the wedding, except for one person (apparently in the witness protection program) who refused to provide his fingerprint. The only thing that would make it better is if the gift included alcohol wipes for use afterwards. I am in love this this product! I fell in love with this product. Not only is it visually beautiful, it is truly a one-of-a kind piece with great sentimental value. It will be treasured for a lifetime. I will certainly refer this product to everyone I know. The perfect wedding shower gift! It looks fantastic! We purchased this for our upcoming wedding in October. We are looking forward to framing it after the wedding. We haven't opened or tried out the ink pads yet. The print is flawless! A great alternative wedding gift! My daughter used this at her wedding and guests loved it! They initialed their fingerprint "leaf" and commented how unique this was as compared to a guest book. So I just ordered one for my nephew who is getting married soon! A great alternative! I ordered this for my son and his fiancÃ© as a pre-wedding gift. They absolutely love the idea of it. It is a special and unique Reminder of their special day that they can proudly display in their home forever. Looking forward to using for wedding guests. So nice to have something different than a traditional guest book that ends up in a drawer and then in a box and then... This will be framed and hung as art to remember the day. This is going to be a very nice addition to my daughter's wedding in the fall. It is a beautiful, high quality item. I'm not sure how it is going to be displayed, however, for wedding guests - it arrived tightly rolled into a cylinder. I think it is over-priced as well. This is such a unique and personalized gift. Bought it as an engagement gift for my son and his fiance'. The quality of the paper and the art is amazing. What a great way to let the family and guests leave their mark, literally, to remember the union of lives. Thank you to the couple for the idea and skills involved. Good variety of colors also to choose. I would highly recommend and a great value.